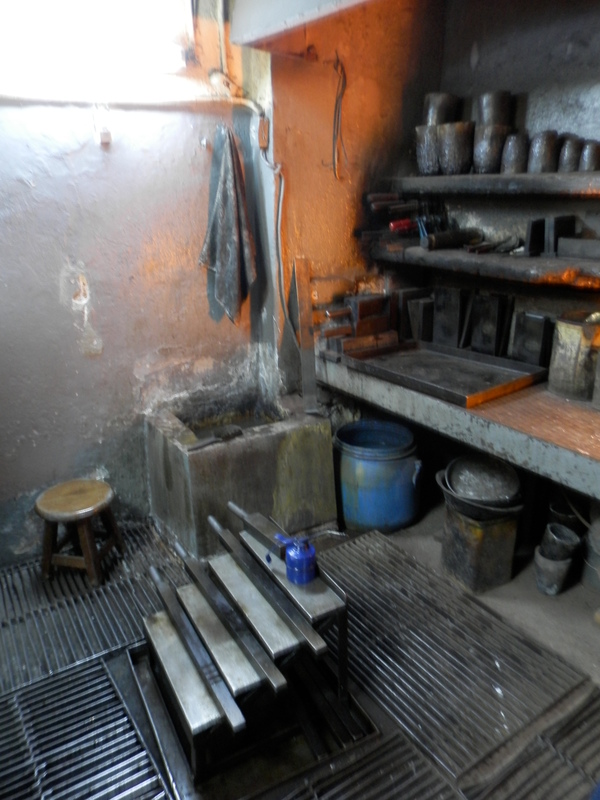 We often say that jewelry making techniques haven’t really changed in thousands of years. Only the tools have been upgraded by technology. Sometimes, not even that is true. When the coil reached the right color—easily seen in the dim light—he picked it up and dropped it into a stone trough of water in the corner. 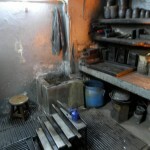 Then he fished it out, tossed it onto the stone floor at the feet of the fellow feeding another coil through the mill. 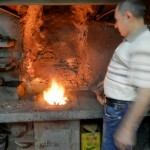 He added a bit of charcoal to his fire, and began heating another coil. 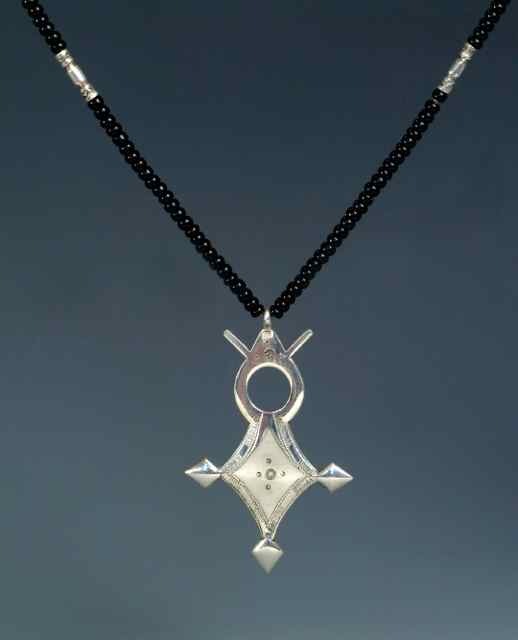 Cross of Agadez, by Elhadji Koumama. Photo courtesy Christine Dhein. Then the other day, I read a post on Christine Dhein’s Green Jewelry News website, about her plan to travel the world learning about sustainable jewelry practices. 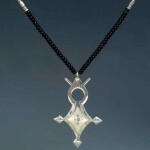 In it, she described the work of Elhadji Koumama, a Tuareg craftsman from Niger, Africa. 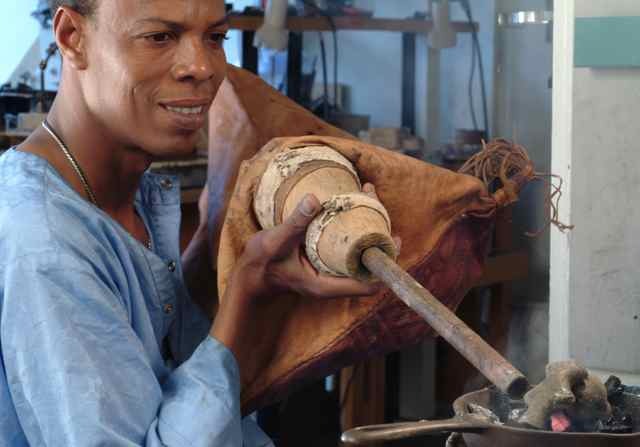 With–to our eyes–incredibly basic tools (making molds and crucibles out of donkey dung is pretty basic), Koumama makes really beautiful jewelry. 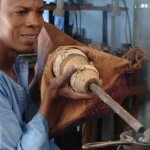 Elhadji Koumama uses a goatskin bellows to heat the metal. Photo courtesy Christine Dhein. Many jewelry makers—no, many craftspersons—get a bit crazy about tools. (I know this. I paint.) They look for the perfect gizmo or widget that will allow the work to make itself. They argue about how buying the less expensive hammer from hither or the more expensive pliers from yon can affect their work. 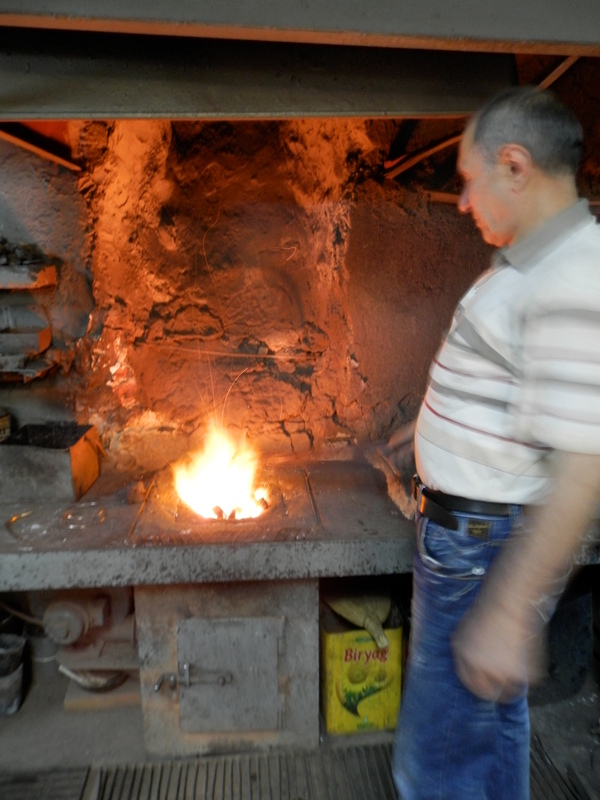 When you see jewelry produced with a goatskin bellows or a bed of charcoal, however, the arguments seem a bit hollow. Makers working in ancient traditions who do not have access to phone-book-sized tool catalogs often have a very high level of skill, said Sturlin, because they have a dedication to the craft that can be absent here. “The fewer tools they have, the more skilled they tend to be,” he said. In fact, he believes, “too many tools can be an impediment to achieving fluency in working with the material.” Like a musician or dancer, he explained, you have to invest the time in learning how to use the tool, use it correctly and learn how to do all that it will do for you. I guess that means there isn’t a brush out there that will paint landscapes for me.